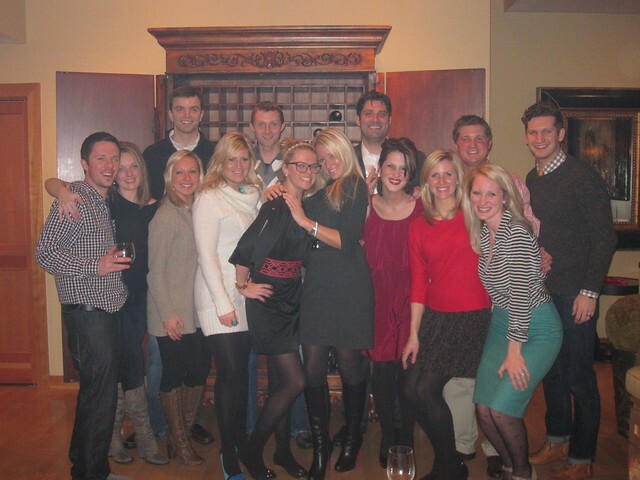 JLP Supper Club: Holiday Party! Have I mentioned how much I love these ladies?! I had been looking forward to our next supper club for weeks! And like always, these ladies never cease to be amazing and fun. 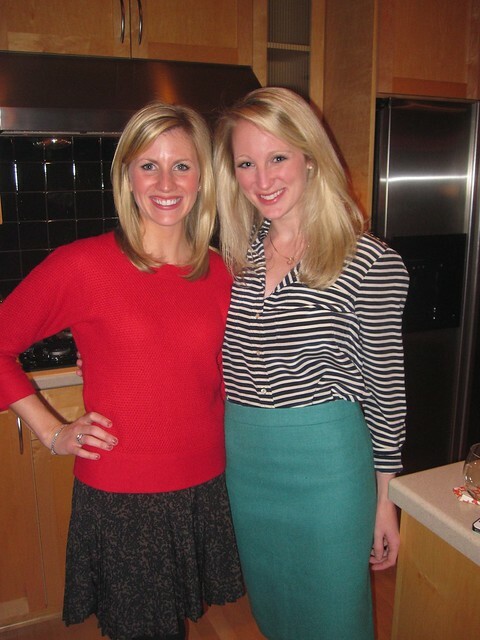 Casey and Ashley co-hosted our December supper club in the Pearl district in Downtown Portland! Our significant others were also invited which made it SO fun! All of the girls were able to make it except for our sweet Camden who had given birth to her first baby the day before! (Woo Woo Camden! We missed you!) I am sad to say I did not take a picture of all of our food! I’m not sure what is wrong with me! It was a spread like you’ve never seen! Beautiful invitation for our December JLP Supper Club! The theme was surf ‘n turf! 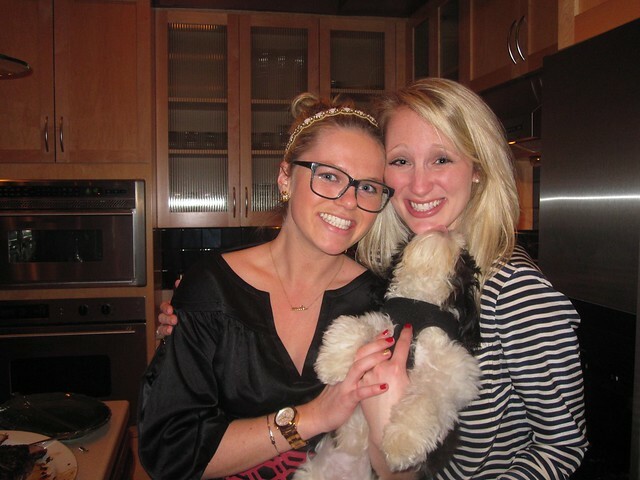 Ashley made an incredible pork tenderloin and Casey had fantastic salmon! I brought bacon wrapped green bean bundles (a family favorite) and a mushroom and rice dish. We also had roasted potatoes, candied yams, a spinach salad with pecans and pears, AMAZING cornbread, and spaetzle! I had never had spaetzle before but I loved it! We had a bread pudding dessert and peppermint bark that was melt in your mouth good. And after typing all of that out I’m regretting once again that I didn’t take a picture! 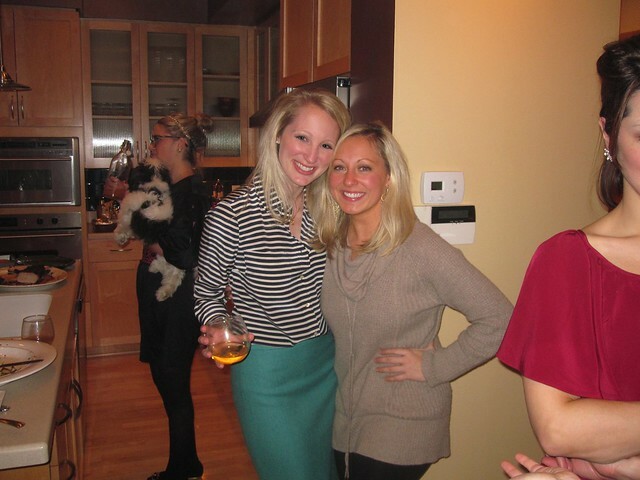 Hostess with the mostess! Casey and I! More lovely ladies! 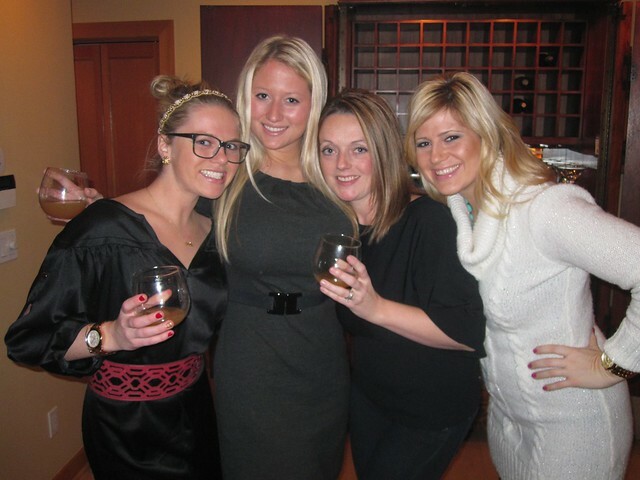 Ashley, Kate, myself, and Casey. William had met a few of the guys before, but I am so glad he got to met the rest of the gang. Everyone mixed and mingled so well…not sure why we wouldn’t but it is wonderful how well we all get along. We do all share one important thing in common…the South (well other than Shannon and she’s our Northerner that we love dearly). One thing is for sure about Southern women, we’ve never met a stranger! 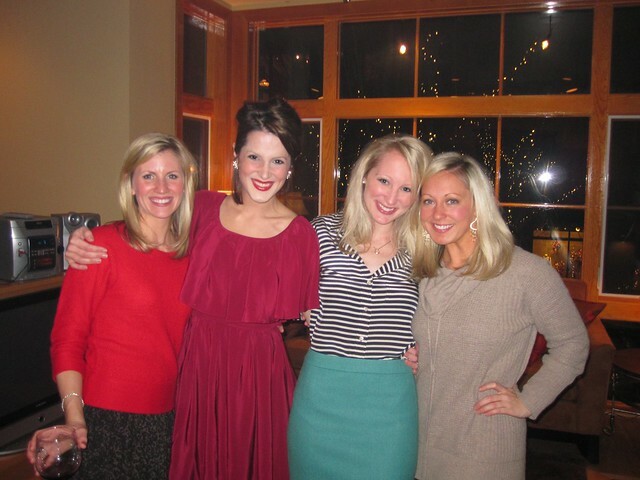 There is so much personality in the room when we all get together–makes for a wonderful time! Funny side note, this picture pose was not my idea, however my mom has a photo just like this of her and her sister and some of their cousins at the beach years ago. They have tried to recreate the picture a few times at different family gatherings and it always made me laugh. Now look at me…doing the can can pose myself, WHICH I might add was no small feat in that pencil skirt! And I would like to give a supreme shout out to Miss Courtney who has an excellently pointed toe in this picture! Courtney and I…and me with a hilarious face because Ashley’s dog was licking my chin. The OTHER hostess with the mostess! A good time was had by all! Already looking forward to January’s dinner! Love love LOVE these girls!!! 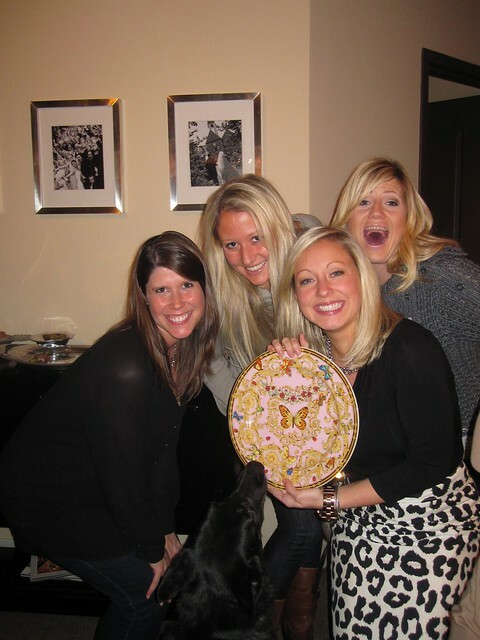 Funny side note about Mrs. Ashley who I’m posing with in the above picture. Her and her husband are amazing and we love them so much already. But, when we were first meeting we realized that we have some really good mutual friends! Ashley grew up right down the street from one of my little sisters in Pi Phi from college, AND Alex is in a program car dealership owners with a good friend of mine from home! Texarkana is a small place my friends…but we get around apparently! (in a good way!) Small, small world! 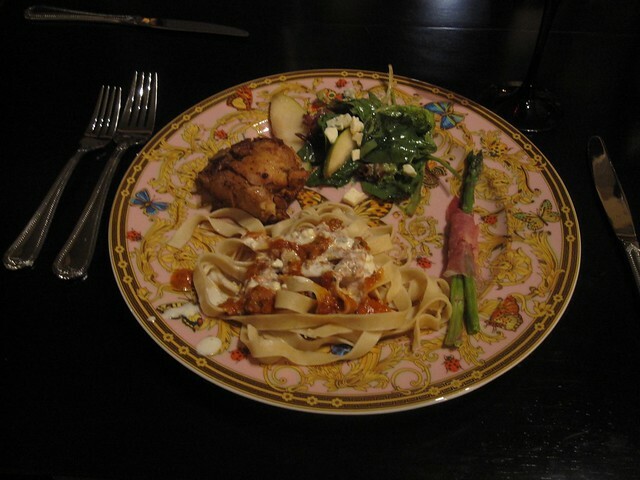 JLP Supper Club Part 1! Invitation to the first JLP Supper Club @ my house! Several months ago I read an article in Gourmet Live called “Whatever Happened to the Dinner Party?” It’s a great article, you should read it especially if you, like me, grew up with your parents (and grandparents for that matter) constantly hosting or attending dinner parties, supper clubs, card nights, etc. I loved growing up around that. To be quite honest, I think it takes a special person to really “entertain” and to do it well. My mom is an entertaining master. She could write a book about it! There is a LOT that goes in to entertaining a group of people and most become very overwhelmed by the entire ordeal. – Have an appetizer. Dinner does not have to be ready when your guests walk in the door. 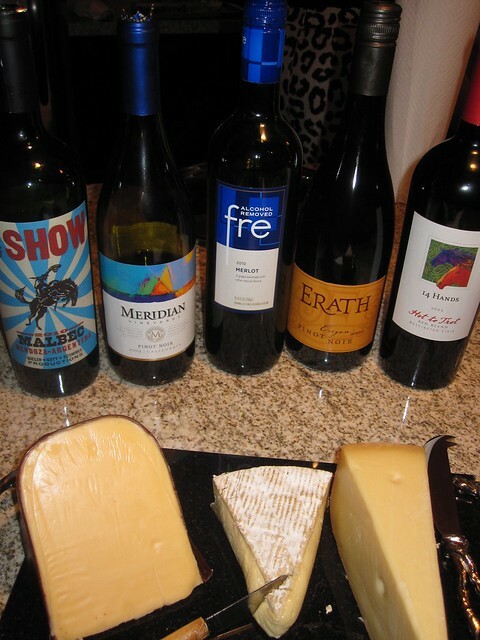 While some might disagree with me, I think having some cheese, wine, grapes, a dip, etc. for the first little while gets everyone’s appetite ready for your meal and allows your guests time to get comfortable in your home. – Discuss your menu with your guests before they arrive. There is nothing more uncomfortable than trying to fake liking a meal. If your guests don’t eat chicken and you make chicken…well then you pooped in the soup! Remember you’re cooking for them, not for you! You can eat your chicken later! – Serve your dinner family style. This is just fun because you don’t have to keep getting up for seconds (and maybe thirds). Just have the food on the table. Most people grew up having meals that way so it is subconsciously comforting. – Enjoy yourself (YOU, the hostess). Your guests are going to feed off of your mood. Put away the stress of your day, the stress of the meal preparation, last minute cleaning (or throwing dirty clothes in the basement), throwing everything in the basement…you get where I am going. If you are comfortable and relaxed, they will be too. Our fabulous table spread! I had a pretty table setting but my table runner wasn’t working out with all of our food so it had to go! I mentioned a few posts ago that I would be hosting our first Junior League Supper Club at our house. There is a great group of girls that I have met through my Provisionals class with the JL of Portland and we decided to do a monthly supper club. I offered to host the first and I was SO excited about it. Not only do I love having people over, but this group of girls is great. Most of them are tied to the South somehow…either they went to college there, have family there, moved from there, etc. so we all have that in common! For our first “theme” we chose “Blue Plate Special” (since we’re all from the South) and decided to have a bunch of good, home-cooked Southern food. 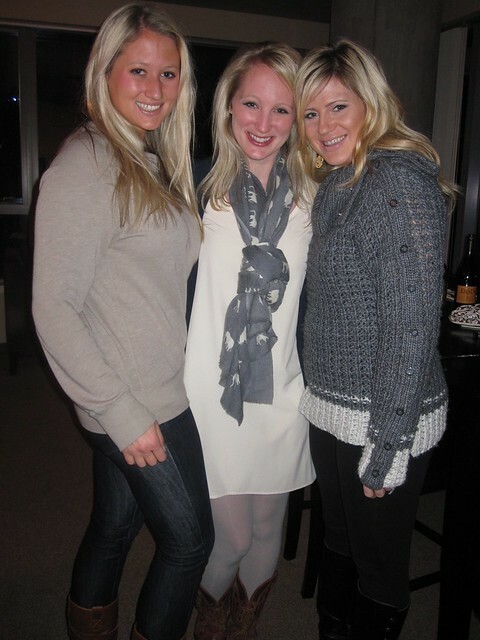 JLP girls! Thank y’all so much for coming! I like the way we decided to coordinate. Each girl brought 1 item which made it incredibly easy on me as the hostess (except for the fact that I ran out of time after work and didn’t have time to dry my hair so it is all curly and crazy!) All I had to do was make 1 item myself and make sure the house was clean! Check and check! I did run out that afternoon in search of folding chairs. Several times since we have moved in we have needed more seating and all we have are 6 dining room chairs. I was thinking we were going to have a few more girls so I grabbed some metal folding chairs at Target for $10.00. But it actually worked out perfectly. We did miss our girls who weren’t able to make it, but I had 1 chair for every hiney! Fried chicken, corn bread, black eyed peas, brussel sprouts, mac and cheese, and a salad! YUM! Our “Blue Plate Special” menu? Fried chicken (that was me), brussel sprouts, mac and cheese, black eyed peas, cornbread, and a salad. With TWO kinds of dessert. These ladies can COOK. It was all SO good. And since I kicked William out of the house for the evening, I made him a plate to eat when he got home. He agreed, it was all very very tasty! Casey and I! The Alabama transplants! Our November supper club is right around the corner! One of the girls offered to gather all of our recipes together after each dinner and put together a little cookbook for all of us which I thought was SO sweet and such a great idea! All I can really contribute is being the unofficial photographer so I think I will nominate myself for that. We can have pictures in the book or something. Might give it a nice twist! 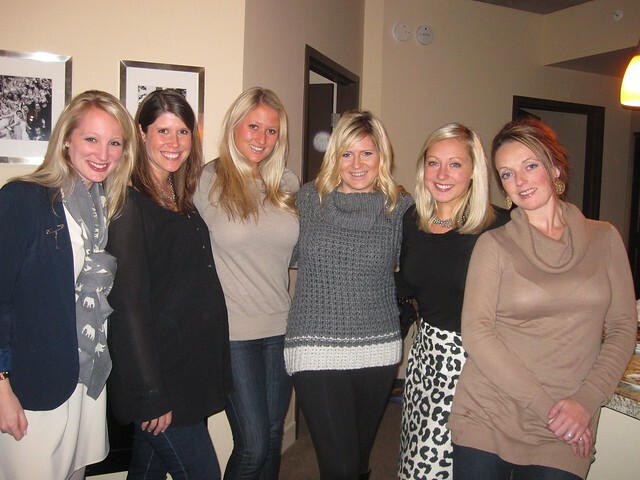 I am so thankful to have met these girls and to be in my first Supper Club! It makes me feel oh so grown up. As strange as it may sound, I know I will cherish each meal with these ladies just sitting, talking and getting to know one another. No distractions from the TV, our phones, families, work, etc. etc. Just plain ‘ole talkin. Doesn’t get much better than that! 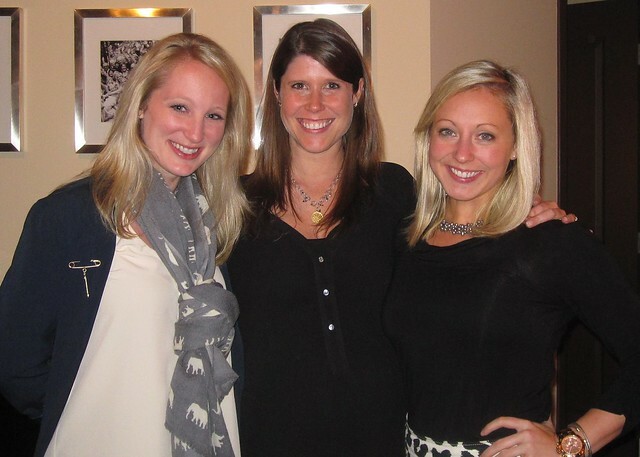 Caitlin and myself with the mommy-to-be Camden! Overwhelmed. In a strangely good way. I realized this afternoon as I was plopped on the couch watching football with William how overwhelmed I am. But not in the traditional way that you would think when someone says they are overwhelmed. I’m overwhelmed in a strangely good way. Today starts October. Which starts (in my mind) fall, though here in Portland it has felt like fall for about a month now. Keeping in mind that I’m from Texas and the weather in October there most of the time doesn’t even feel like fall, but that’s still my mindset. Apparently it needs to be readjusted. Regardless, October enters in pumpkins, and sweaters, and boots, and my birthday, and Christmas is around the corner, AND my mind is FULL of parties and events and gatherings I want to host. I, like every other female in America it seems, have a growing addiction to Pinterest which has just made my condition worse. Now that we live somewhere that the weather is actually reflecting what time of year it is, I have so many things that I want to do and what feels like so little time to do it. How much of a serious problem do I have that I am anxious about being able to host all of the get togethers that I want to before the rain sets in? Answer: a large problem. Potentially hosting a Halloween party at our house! I should rephrase. I want to host a Fall Carnival. I’m not kidding. I’m really excited about this one. Host a weekly dinner for those who are “cashing in” their wooden nickels at Dixieland Delight. I’m going to make posts about these…I’m pretty excited about them. Lastly, hosting a football/tailgating party at our place a little later in the season (might have to move into November for this one). Our new friends up here think our passion for football is quite comical and I want to have people over for a real football party to give them a taste of what being a fan (in the South) is really about! WHEW! I’m telling you I could be the world’s best party planner. Not really, but I do enjoy throwing a good party. I am making a post about this mostly because I think getting all of my ideas out in the open will force me to see them through. I am so thankful our new friends here in Portland are just plain fun people. They’d totally be down for all of this. Otherwise we’d be partyin’ alone! Calling out to all my party people in Portland! Get ready. The Bryants are about to show you some fun! I have also promised myself to post 3-4 days out of the week until the end of 2011. Starting today October 1. I am actually doing a little personal experiment with this. Hoping I impress myself. Happy Fall everyone!